Toronto and Scarboro' Electric Railway, Light and Power Company was established in August 1892 to provide street railway service to the Upper Beaches district within the City of Toronto, Ontario and to the neighbouring Township of Scarborough. Except for two branches, the line ran as a radial along Kingston Road. In 1904, the TSERLPC became the Scarboro Division of the Toronto and York Radial Railway, a subsidiary of the Toronto Railway Company. In 1922, the radial line was acquired by the City of Toronto which contracted the Hydro-Electric Power Commission of Ontario operate the line as the Hydro-Electric Railways: Toronto and York Division. After 1927, the radial service was operated by the Toronto Transportation Commission but with city streetcar service being extended to the Birchmount Loop. Beyond Birchmount, radial service ceased by 1936. This article is more about the Scarboro radial than about the company that originally created it. On August 18, 1892 the Toronto and Scarboro' Electric Railway, Light and Power Company was incorporated to provide electric streetcar service along Kingston Road, and to produce and sell electricity to customers in the vicinity. Henry Pellatt (of Casa Loma fame) was the chairman of the board of directors. On July 1, 1893, the Toronto and Scarboro' Electric Railway, Light and Power Company started electric, radial operations with a route on the north side of Kingston Road from Queen Street to Blantyre Avenue. In early July 1893, the railway created a branch for summer service on the west side of Blantyre Avenue south to Victoria Park, a lakeside recreation area roughly at the location of today's R.C. Harris Water Treatment Plant. In 1894, the railway opened a branch running from Kingston Road and Water Street north via Lyall Avenue and Kimberley Street to Gerrard and Main Streets. In 1897, the railway ripped up its track on Blantyre Avenue and relaid them along Kingston Road to near Warden Avenue. On July 12, 1901, service was expanded 1.7 kilometres (1.1 mi) along Kingston Road from Warden Avenue to Half Way House at Warden Avenue. The expansion was triggered by threats by township to cancel the railway's franchise. The railway was reluctant to expand as Scarborough then was very rural with only a small population. On August 1, 1904, the Toronto and Scarboro' Electric Railway, Light and Power Company was merged into the Toronto and York Radial Railway becoming its Scarboro Division. On January 23, 1905, service reached Mason's near Bellamy Road. On December 24, 1905, service reached Scarborough Post Office at Markham Road. On August 31, 1906, service reached West Hill (near today's Fairwood Crescent) where a station was built. In 1912, the railway opened Scarborough Heights Park (also called Scarborough Park), a 60-acre tract extending from Kingston Road to the lake between Midland Avenue and Bellamy Road. In 1913, the branch from Kingston Road to Gerrard and Main Streets closed due to competition from the new Gerrard line of the Toronto Civic Railways, which opened on December 18, 1912. Riders found that the Gerrard route was a more direct route to get downtown. On August 16, 1922, the City of Toronto formally acquired the T&YRR lines. The plan was that the city portions of the T&YRR radial lines would be incorporated into the TTC, and the portions outside the city would be managed by Ontario Hydro as the Hydro-Electric Railways: Toronto and York Division. Thus, the Toronto streetcar system replaced the radial line between Queen Street and Victoria Park Avenue, making the latter street the western terminal of the radial line. On November 1, 1922, Hydro-Electric Railways took over operation of the T&YRR lines outside of the city limits. Hydro transferred new cars from its Guelph Radial Railway operation, and constructed a new terminus at Kingston Road and Victoria Park Avenue. On December 2, 1922, the TTC opened the Bingham Loop. City streetcars now replaced the radial cars along Kingston Road from Queen Street to Victoria Park Avenue. On January 12, 1927, the Toronto Transportation Commission started operating the T&YRR lines under contract including the Scarboro line. The TTC connected Scarboro radial tracks to the city system at the Bingham Loop. It also closed the Warden Carhouse (just east of Warden Avenue), and transferred operations to the Russell Carhouse under the TTC's Radial Department. This 1928 image shows the Birchmount Loop under construction with the single track of the Scarboro radial line passing through. On November 18, 1928, the TTC extended the Kingston Road streetcar line with double-track east to a new Birchmount Loop, where radial passengers could now transfer to the city streetcars. At the loop, there was a station-like structure containing a waiting room. After the 1929 season, Scarborough Heights Park permanently closed. On July 13, 1930, radial service east of Scarborough Post Office (just beyond Eglinton Avenue) was replaced by Gray Coach bus service. On June 25, 1936, Scarboro radial service ended being replaced by buses on the next day. On July 1, 1954, the TTC terminated streetcar service to the Birchmount Loop replacing streetcar service east of Victoria Park Avenue by buses. The introduction of a new fare zone system and a reorganization of the suburban bus network lead to the termination of streetcar service east of Victoria Park Avenue. When the West Hill station opened in 1906, it featured a waiting room, restaurant, barbershop, reading room and a public telephone. Customers could park their horses here while riding the radial car into Toronto, an early park and ride facility. In 1922, the TTC took over the radial route between Queen Street and Victoria Park and converted it into a double-track streetcar line. The streetcar line ended at the Bingham Loop between Bingham Avenue and Victoria Park Avenue. 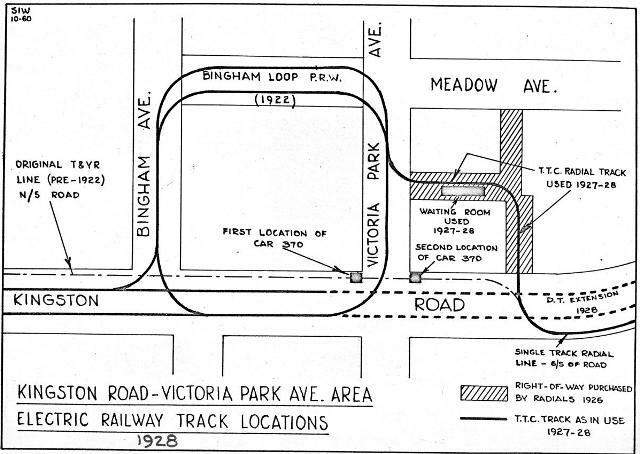 The Scarboro radial line ended on the east side of Victoria Park Avenue. Almost finished Scarboro radial connection to Bingham Loop with crane car C-2 at the new radial terminal. When the TTC took over operation of the Scarboro radial line in 1927, a new radial terminal was built in two stages. As a temporary measure, the body of old TRC car 370 was used as a curb-side waiting room placed initially at north-west corner of Kingston Road and Victoria Park Avenue and later moved to the north-east corner. Then, the TTC built a new off-street terminal with a waiting room behind the north-east corner. Just before reaching Victoria Park, the radial turned north into an alley then west into another alley behind buildings facing Kingston Road. The TTC then connected this terminal track to the Bingham Loop so that radial cars could pass through it to be stored at Russell Carhouse. Radial cars used Bingham Loop only for carhouse access; radial passengers had to use the radial terminal on the east side of Victoria Park Avenue. When radial cars entered service from Russell Carhouse, they had to go to the north side of Bingham Loop, then reverse into the radial terminal across the street. When the streetcar extension to Birchmount Avenue was being built along Kingston Road to the new Birchmount Loop, the westbound track was built first, and the radial cars used that track in both directions until the eastbound track was ready. Warden Carhouse (?-1927), just east of Warden Avenue on the south side of Kingston Road. ^ a b c d James Bow (25 June 2015). "Route 502 and 503 - The Kingston Road Streetcars". Transit Toronto. Retrieved 2016-05-12. ^ a b c David A. Wyatt. "History of Regional Transit in Toronto, Ontario". University of Manitoba. Retrieved 2016-05-01. ^ J. William Hood (1986). Toronto Civic Railways, An Illustrated History. Upper Canada Railway Society. p. 15. ISBN 0-921429-07-X. ^ a b c Robert M. Stamp (1989). Riding the Radials, Toronto's Suburban Electric Streetcar Lines. The Boston Mills Press. ISBN 1-55046-008-0. Retrieved 2016-04-16. Chapter 9 - Who Wants to Run the Radials? ^ a b James Bow (25 June 2015). "Venerable Bingham Loop". Transit Toronto. Retrieved 2016-05-12. ^ a b c d John F. Bromley (1979). TTC '28; the electric railway services of the Toronto Transportation Commission in 1928. Upper Canada Railway Society. pp. 10–12: The Radial Network. Retrieved 2016-05-05. ^ a b James Bow (25 June 2015). "Remembering Birchmount Loop". Transit Toronto. Retrieved 2016-05-12. ^ a b Steve Munro & John F. Bromley (22 December 2013). "Kingston Road Reconstruction". Retrieved 2016-09-15. This page was last edited on 12 January 2018, at 08:10 (UTC).